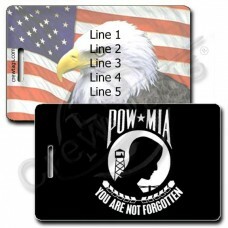 Show your support for America's POW/MIA with these POW/MIA Luggage Tags. Each luggage tag can be customized with up to 5 lines of your own personal information. A portion of the proceeds from each sale is donated directly to The National League of POW/MIA Families. Show your support for America's POW/MIA with these POW/MIA Luggage Tags. We can print just about ..